Injector Type (choose from list)*: 42lb Disc 01D030B "009's"
This is a special package including the AXiS device and an AXiS chip (currently for 28lb, 42lb, 60lb, and 80lb injectors). For the 86-87 turbo Buicks, and 89 TTA's. 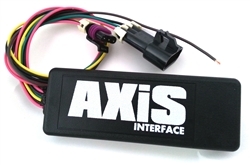 The AXiS Interface device allows the replacement of the stock MAF sensor (mass airflow) with newer, more reliable, and higher flowing MAF sensors (cannot be used with a stock MAF). This is one step up from a basic Translator. It also adds the capability to tune fuel and spark advance when used with a compatible chip in the ECM. It can be used with any ECM chip in order to use a new MAF sensor. To use the extra WOT fuel and timing adjustments, a special ECM chip is required, such as the AXiS chip, or an Extender chip (made for the AXiS). The included AXiS chip in this combo is a great, cost effective chip that takes advantage of the features in the AXiS Interface. The chip has no internal parameters to adjust, just plug it in and go! All adjustments are done inside the AXiS box and are permanent, so they can't be lost if the battery is disconnected. The base spark advance at WOT is about 17 degrees, and can be tweaked up or down using the dials in the box. The MAF connections are plug and play, and the spark control is a one wire connection.